In Greek mythology, Minoas was the first King of Crete, son of Zeus and Europa. Every nine years, he made King Aegeus pick seven young boys and seven young girls to be sent to Daedalus's creation, the labyrinth, to be eaten by the Minotaur. After his death, Minos became a judge of the dead in the underworld. 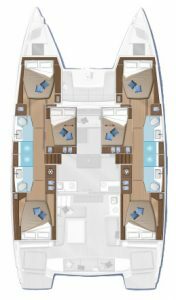 We are pleased to inform you that our company has already placed an order on a brand new catamaran Lagoon 50, which is scheduled to be delivered in 2019 (2019 model), and will be available to charter during the next season 2019. The name of the new catamaran is “Minoas”.